Microsoft Research and Georgia Tech are studying "video play dates" for kids. Some parents like the idea of "video playdates"
(CNN) -- On Friday morning, I published a story about researchers and parents who are trying to get kids to play together remotely, using video conferencing techniques. The article featured three kids who already are testing out these "video playdates" in real life, as well as a researcher at Georgia Tech University who is trying to make these interactions more fruitful and educational for kids. Many of you responded to the story. And, in general, the message was loud and clear: You don't think kids should go on "video playdates." You'd much rather they play together in real life, unmediated by computers. On the CNN homepage, we posted an unscientific poll that asked readers this question: "What do you think of 'video playdates' for kids?" As of late Friday afternoon, 94 percent of you -- more than 57,000 people -- said it's bad idea. The remaining 6 percent said it's a good idea. pwoodside: "Where's the 'play' in connecting w friends via video? Kids are more wired than ever. They need us to help them find balance." bfloeagle: "Better than TV but not as useful as direct interaction with other children." dailyplotvomit: "Unless people want their children to grow up to be like me, anti-social and addicted to [technology], I vote bad idea." John_Sia615: "no, children should have actual playdates. When I was a kid I went to my friends' houses." SeanNJ: "I guess they'll start scheduling their video playdates via Facebook Events... These are the times I loathe my species." tlh2: "Absolutely wrong. No way should a kid be 'playing' with images on a computer!!! We need our children to learn, explore, play, jump, run, read... Our children need to be in the REAL world - not in the world that the computer creates for them. This is wrong for sooo may reasons." t3chsupport: "My son (he's 4) has been exposed to Web cams since he was an infant, since all of his grandparents live very far away. As long as he knew how to talk, he's been talking to them on there. He understands where they live, and that they're not in the computer or anything nonsensical like that. It's all very normal to him. He's got plenty of 'IRL' friends, but I've been thinking of setting up some conversations with kids with him. He's great with computers and gadgets and stuff (again, for being 4), I think he'd have a great time with it." RealCatholic: "I do see a great value in this for relatives and friends that aren't local, like cousins in another state or country, or if weather conditions make it difficult for interpersonal interaction." Megaera80: "We're going to end up like those fat flying-chair-people in [the movie] 'Wall-E.' "
szb86: "This is simply trying using technology for technology's sake and forcing a technology into an area where it is not appropriate and kind of silly. 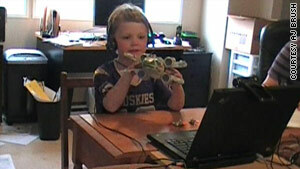 Video conference is great for conversing and probably could be used to play as small set physical games (there are all ready a large set of online multiplayer games available), but kids are going to lose interest very quickly when they try to play trucks or action figures or Barbies this way." Thanks again for the discussion. As always, feel free to reach out to us on Twitter or in the comments section below.